Bali is a world-class surfing destination, with tropical weather, steady waves and warm waters attracting beginners and advanced surfers from across the globe wanting in on a piece of the action. Affordable accommodations and party vibes make Bali popular with the young, hip surf crowd, while there are plenty of surf camps and surf lessons available to suit all skill levels. It’s no problem if you’re travelling without your own board, as surf stores and board rental shops are found all over the island and surfing equipment can be hired at affordable prices. The best surf spots are found on the southern side of Bali, with the Bukit Peninsula providing smooth breaks and intense swells during the dry season from April to November, with consistent 12 foot waves available for expert surfers. Outside of the dry season things mellow out a bit, but you will still find swells from two to six feet around the south coast. During the wet season, the east coast provides a better option, with large swells found in Nusa Dua and Keramas. Here are some of our favourite surf spots around Bali, which are still fun to visit even if you’ve never picked up a surfboard in your life. Watching the pros ride the waves while soaking up the sun is an attraction in itself. This renowned surf spot is as famous for its waves as it is for its magnificent location, where the turquoise ocean meets dramatic cliffs housing the spiritual mecca that is Uluwatu Temple. You’ll never forget the experience of catching a wave and then looking up to see one of the world’s most spectacular Hindu shrines looking over you from the cliff top. The beachfront is scattered with bars, warungs and cheap massage joints, so the beach can get a little crowded when the swell is mellow, but once barrels reach over four feet the casual surfers clear out and only the pros remain. The waves here are fast and powerful and you should always check tide charts to avoid being swept too far out the reef. 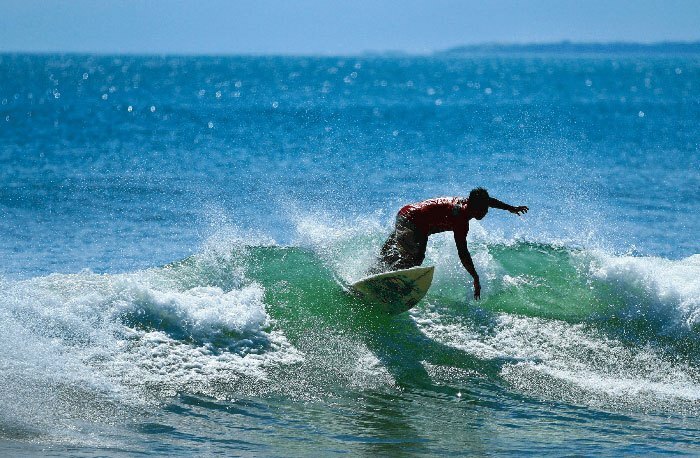 Home to multiple international surfing events including The Rip Curl Cup, Padang Padang is a kind of spiritual home to global surfers, with many of Bali’s surf camps located here. Padang Padang Beach itself is situated between Uluwatu and Bingin, with an exotic 100 meter stretch of golden sand and an entrance via a spectacular hollow rock. Swells are consistently four feet and above and reserved for advanced surfers, but the surf break is further out on the reef so the shore is also safe for regular swimmers. Be careful of the sharp reef that lies underneath the barrels. Balangan Beach is a surfer’s paradise located further down the southern coast, just a kilometre from Dreamland Beach. In the past, the challenging location meant Balangan was only frequented by the most dedicated surfers, but new roads and clear signs mean this beach is now easily accessible and fast becoming a favourite haunt for many wave riders. Balangan waves are known to be fast, hollow and at their best around mid-tide, so checking tide charts will help you plan for the best swells. Waves can reach from two feet to as high as ten feet, with average waves around four feet. The coast itself is stunning, with golden shores surrounded by limestone cliffs, seaweed covered rock formations and palm-fringed sands. Keramas is a long-standing favourite with surfers in Bali and no surf trip to the island would be complete without a stop at this black sanded beauty. 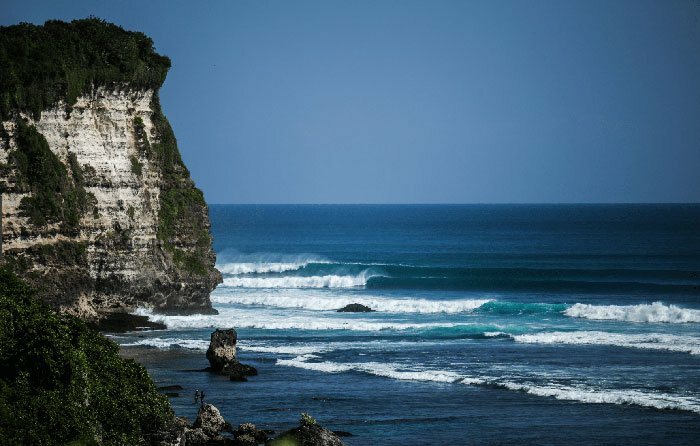 Keramas not only provides a unique landscape, with views out to Nusa Lembongan, it also produces a solid swell, with powerful right hander waves that average around five feet. Morning is the best time to surf Keramas, so getting up early will help you avoid the crowds. The newly opened Komune Resort & Beach Club is built right on the beach, so those who can afford to splurge can have the world famous Keramas surf break right on their doorstep. Kuta was the first beach to draw surfers to Bali, and while it bears no resemblance to the palm-lined paradise it once was, Kuta Beach remains the most popular stretch of beachfront on the island and is a great surf spot for beginners. Small swells provide a non-intimidating space for learners, while boards can be rented by peddlers directly off the shore at low prices by the hour or by the day. Waves at Kuta are fairly consistent, ranging from around one to three feet.